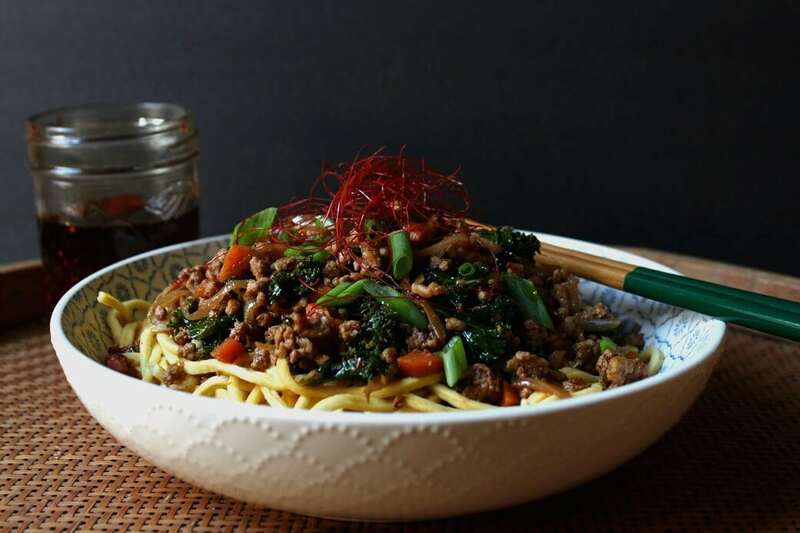 A quick and spicy ground pork stir fry, perfect for when that spicy noodle craving hits. Perfectly balanced flavours with sweetness, saltiness, umami and a nice kick of heat from Szechuan peppercorns and Korean gochugaru. A simple bowl of noodles is perhaps, the most comforting dish found around the world. There are many kinds of noodles, but in it’s simplest form, the humble noodle is made from an unleavened dough of processed grain and water. Noodles are commonly made from wheat dough, but there are many other grains that have found their way into noodle recipes world wide. The resulting dough is stretched, rolled, flattened or extruded then cut, shaped, or filled according to regional and personal preference. I often stop and wonder about the variety of noodles found in countries around the world. It’s exciting to think of the innovative possibilities a clever cook can make from such a basic dough. Creative cooks the world over have found ways to mold, cut, and shape pasta dough into amazing dishes. From Ramen and Udon in Japan to Nokedli in Hungary, Couscous in Morocco, Tteokbokki in Korea, Perogies in Ukraine, Tortellini in Italy, and North American Mac ‘n’ Cheese. This simple, yet cost effective and sustaining food exists in so many varieties. For this post, let’s investigate the birthplace of the noodle. 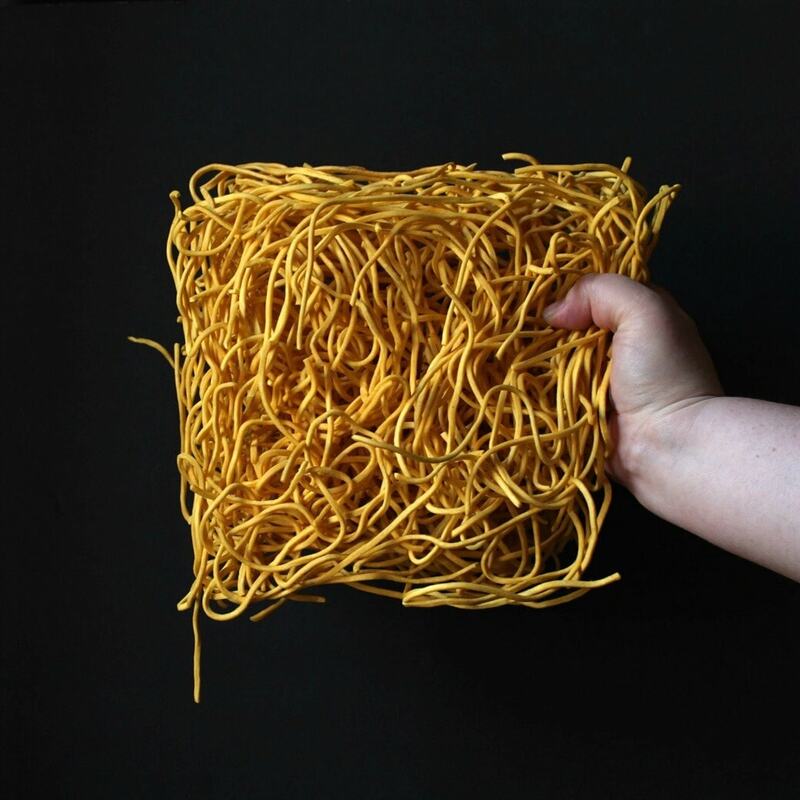 China is widely accepted as the birthplace of noodles, though there tends to be some push back from Italy. 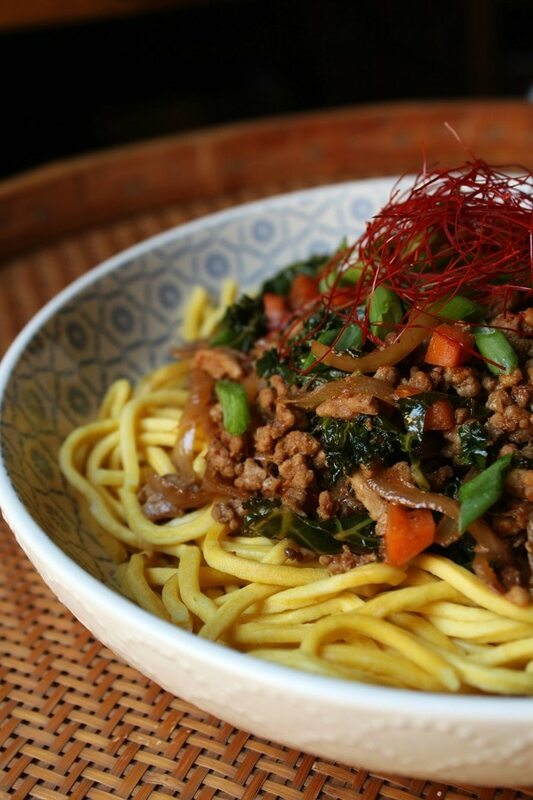 This fact is evidenced by the first written account of noodles during the Late Han Dynasty (25–220 AD). However, the earliest physical evidence is of a 4000 year old bowl of noodles found in a Chinese archaeological site. The bowl of ancient noodles was carbon dated using grains (foxtail and millet) found within the same context. 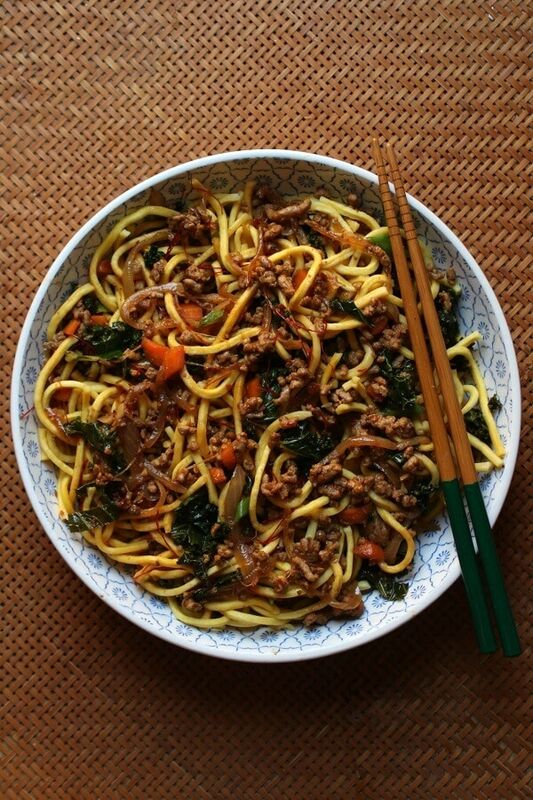 It is unclear exactly what grain was used for the noodles, which appear to be of the hand pulled variety. They were not made from millet because the grain contains no gluten and would not be stretchy or malleable. Stir frying is a popular Asian cooking method. It involves the quick frying of meat and vegetables in a very hot wok or high sided pan. Constant stirring is necessary to prevent burning and ensure that the food is cooked evenly. 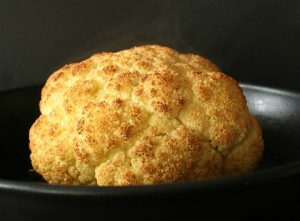 To prevent over cooking, vegetables are stir fried first, then set aside while the meat is quickly cooked. The meat (in this case ground pork) is seasoned with spices and sometimes sauces, then the vegetables are reintroduced. Sometimes a sauce is added at the end of the cooking process. 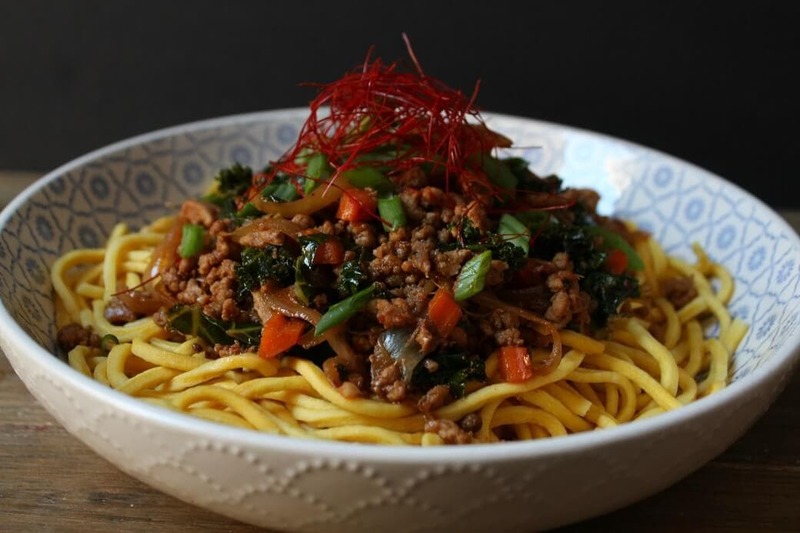 While most stir fries use strips of meat, this recipe uses ground pork. This recipe, which was adapted from 101 Easy Asian Recipes by Peter Meehan, is a riff on MaPo Tofu. MaPo Tofu commonly uses ground pork in conjunction with Szechuan spices and silky tofu. However, there is no tofu in this dish and I have also added small diced carrots and slices of kale. In addition to the Szechuan peppers, gochugaru (Korean dried red pepper) and chili flakes add another layer of heat to this dish. Sweetness from the sweet black vinegar and brown sugar, and an umami boost from the doenjang (fermented bean paste) round out the flavours. Add oil to a large frying pan or wok. Add onion and carrot. Cook until translucent. Remove and set aside. Add a bit more oil to pan, then add the ground pork. Break it up into smaller chunks as it cooks. When the meat is almost browned through, add garlic and rest of the seasonings. Cook for a few more minutes. Add 1/4 cup water to the pan, then add the kale and cover. Cook until the kale becomes wilted. Serve over noodles or rice as desired. Wow! I’ll never look at a noodle the same way again! Very informative post. 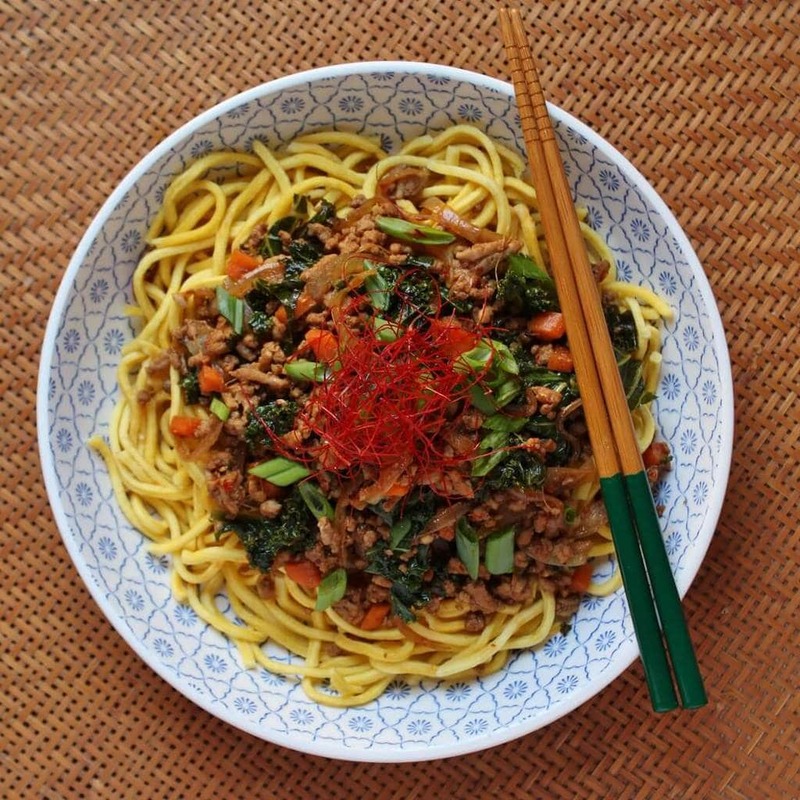 Love the kale in this tasty stir-fry! Thank you Elaine! I thought I’d go for something a little darker than bok choy. It’s not traditional but it works! Interesting information and the recipe looks absolutely delicious. A perfect weeknight meal to wake up your tastebuds! Thanks for stopping by Phillip! It’s a live one! Bernice – you read my mind, this is exactly what I’ve been craving the last few nights. I can’t wait to make this. Awesome!! It really is a craving, isn’t it?!! Hope you enjoy the dish!